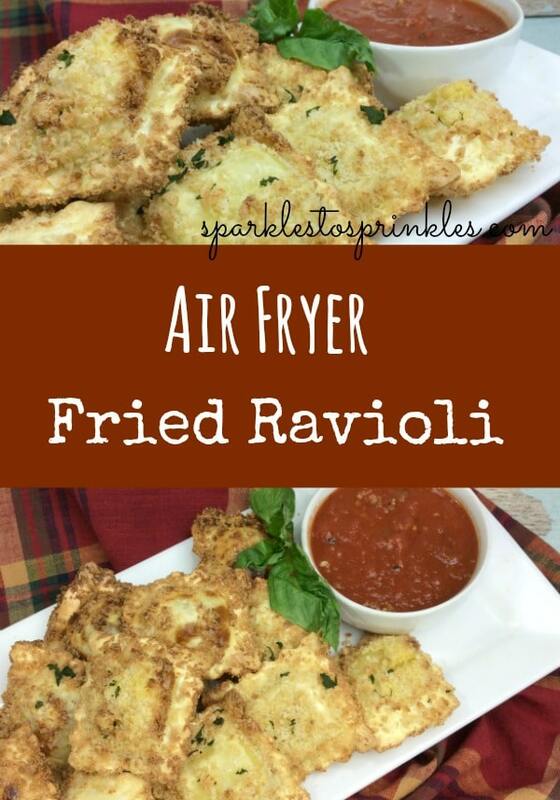 These Air Fryer Fried Ravioli are such a delicious crispy lighter version appetizer treat. It is so much more fun to eat these tasty appetizers at home (maybe sitting on the couch or maybe not, lol) than sitting in a restaurant. My boys have gotten so tired of chips & dip and cheese & crackers. They thought they were in heaven when I brought these out for Sunday football. I love being able to make them in my Air Fryer. I love saving some calories and making these a bit healthier. My boys are all about hot delicious fried ravioli. 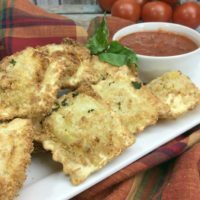 Delicious crispy Air Fryer Fried Ravioli that are an amazing game day treat. Mix together the panko breadcrumbs, parmesan cheese, and red pepper flakes. Place the tortellini in a medium sauce pan filled with water. Dip each piece into the beaten eggs, and then into the panko mixture. Heat the Air Fryer to 360 and cook the tortellini for about 5 minutes on each side, until golden brown. My favorite ravioli, cooked healthy way! Thanks, Melissa, for reminding me this recipe!